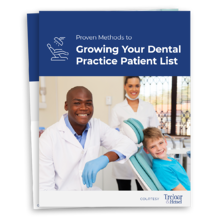 Learning about, and implementing proven strategies of how to grow and create a patient list can be one of the most powerful things you can do to build a successful practice. Typically, for a dental practice to grow, a single dentist should be seeing 24-50 new patients per month. Are you hitting these numbers? Fill out the form and we will send you our in-depth guide on how to grow your dental practice.